Bukit Rhema or known as the Chicken Church was built in 1992 by Daniel Alamsjah. 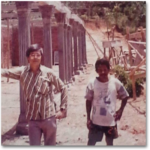 Daniel Alamsjah received a vision in 1988 to build a House of Prayer for All Nations after praying overnight at the place where Bukit Rhema was built. Young Daniel did not initially know that this place was in Gombong Kembanglimus Village, Magelang, Central Java; located at the corner of City of Borobudur. In spite of this place was far from where Daniel lived; he was living in Jakarta at that time, his faith still led young Daniel to visit this place and then Daniel Alamsjah received that vision. Daniel believed that there would be many people coming, flocking from All Tribes to Bukit Rhema in order to see the goodness of God. Because of this vision, Daniel spent most of his life building Bukit Rhema. The Beginning of Bukit Rhema Development was the difficult moment for Daniel because he spent 5 days of his time working in Jakarta and on weekend he had to monitor the development of this building in Magelang. More than 10 years Daniel spent Friday night and Sunday afternoon on the train of Jakarta – Purworejo – Jakarta. Then, on Monday morning he came to his routine as a private employee in one of the companies in Jakarta. Many challenges once got in his way, but Daniel believed in God’s perfect help. Daniel continued to awaken his sense of service by building a Drug and Mental Rehabilitation Center not far from Bukit Rhema. The Rehab center was named Betesda Rehabilitation Center. At the age of over 70 years, God continued to provide health for Daniel, so he could learn how to rehabilitate drug users and has been able to serve those who lost. Currently Bukit Rhema is known as Chicken Church which has 7 storeys (floor), each floor will have different “story telling”; which telling the Spiritual of Man’s Journey, the Meaning of Prayer, God’s Goodness, Miracle and Local Wisdom. All of this is set in interconnected paintings and it has moral value for visitors. Currently, Bukit Rhema continues to develop into religious tour, natural tourism, educational tour and culinary tour in Magelang. Bukit Rhema provides some quite private prayer rooms for anyone who wants to pray. The place of the prayer rooms is located in the basement of the Dove-Shaped Building. The rooms are special to pray because Bukit Rhema as the Chicken Church is not only known as a Church but also the house of prayer for all nations. Do you still remember about drawing lesson when you were a kid? We were thaught to draw two mountains and the sun was right out in the middle. Surely, if you come to Bukit Rhema, you can see beautiful sunrise here. No wonder many people are willing to wait from down to see the sun rise between two mountains. Perhaps this is the inspiration of our drawing lesson in the past. Bukit Rhema is also known for being one of the best and most beautiful private sunrise spot in Magelang besides Puthuk Setumbu. After seeing the sunrise from the crown of Bukit Rhema that resembles the shape of chicken, visitors then can watch and take pictures of paintings on the wall of this Bukit Rhema. Each floor has paintings with different themes ranging from the warning signs of drug abuse to the younger generation, the journey of life to nationalism in our country. Kedai Rakyat W’Dank Bukit Rhema is now opened. This cafe is located on the back of Bukit Rhema. The scenery is also beautiful with the view from the crown of the dove-shaped building. With gentle breeze while sipping the traditional warm wedang (Indonesian form of beverage) as well as the coffee sold in this shop will make you feel like living at home where many people call this ‘Chicken Church’, especially for those who come to this place, every entrance ticket of Bukit Rhema that you buy has included free cassava traditional food which is named Latela Gombong Cassava. Latela Gombong Cassava is processed by local residents and served with traditional chili that makes the taste of cassava more delicious. Have you ever eaten cassava with chili sauce? Let’s try it at the Kedai Rakyat W’Dank Bukit Rhema. Cassava flavor is not the same as fried cassava that you usually eat. In addition, Bukit Rhema (Chicken Church) is also one of the driving force of Borobudur tourism village and people-oriented economy through bundling entrance ticket of Bukit Rhema with Traditional Food (Latela Gombong Cassava). Latela Gombong Cassava is cassava produced and processed by residents around Bukit Rhema (Gereja Chicken).